One of Rebecca Carey’s favorite exercises to do with the actors she coaches at the Oregon Shakespeare Festival is called “Cameraman.” Carey, who is the voice and text director of the renowned company, said “Cameraman” at first can make even actors feel a little silly, because in order to pretend they are filming the action of a Shakespearean scene, they have to hold an imaginary movie camera up to their eye. The “cameraman” would first imagine that she was filming Troy: she pans across the massive walls of Troy in front of her. Then, for the isles of Greece, maybe she moves the camera up in the air and pretends to get a helicopter shot, panning over the islands. For the prince’s orgulous, she zooms in for a close-up of the angry face of the prince. Carey said this kind of visualization of the complex 400-year-old text is a great exercise for all actors, but seems to work especially well for the dyslexic ones, which, when she was teaching in the United Kingdom, she estimates to be about 10-20 percent of all the actors she worked with. Here in the United States, she said, the percentages seem to be about the same, though it seems that a lot of younger actors have an official diagnosis, while some older actors never received anything official, though they have trouble reading and memorizing. Carey said that the name "Sandbox" comes from kids' imaginary sandbox games. “It’s like a little kid in a sandbox, like ‘First, Superman did this!’ And you pick up Superman and make him fly around in the air. ‘And then Batman came along and did this!’ So it’s a way to use your toys to act out Shakespeare.” These childlike games are far from pointless; visual and physical explorations can help an actor who has difficulty with Shakespearean text make it more concrete by grounding it in their reality, an idea Carey adapted while teaching in Great Britain from Petronilla Whitfield, associate professor and senior lecturer of voice and acting at the Arts University Bournemouth. After 20 years as a professional actress with prestigious companies like the Royal Shakespeare Company, Whitfield went back to earn a Ph.D. in voice and acting, the focus of her work centering on how to help dyslexic actors read, understand and perform Shakespearean text with less difficulty -- not to mention the fear and anxiety she said often accompanies dyslexics' expectations that they will be forced to read aloud in front of their peers. 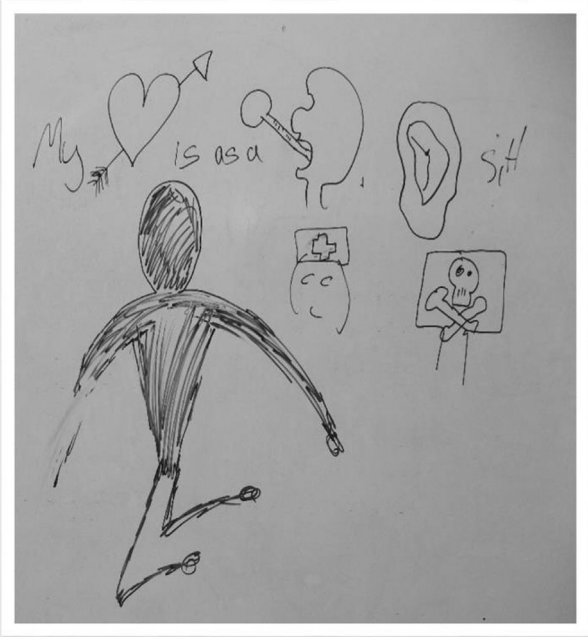 Storyboard by a student of Psychological Gesture, courtesy of Petronilla Whitfield. Whitfield said that imagery is often the key that unlocks the door of understanding and memory, and her research supports the idea. People with dyslexia often feel disassociated from the words and their meanings, and attaching imagery to the words makes them more concrete and three-dimensional, as well as easier to remember. Using a technique Whitfield calls “visual storyboarding,” she often asks her students to draw or find images that help prop up their understanding. Often, the images aren’t literal -- they can be colors to suggest an emotion, for example -- but sometimes they are. 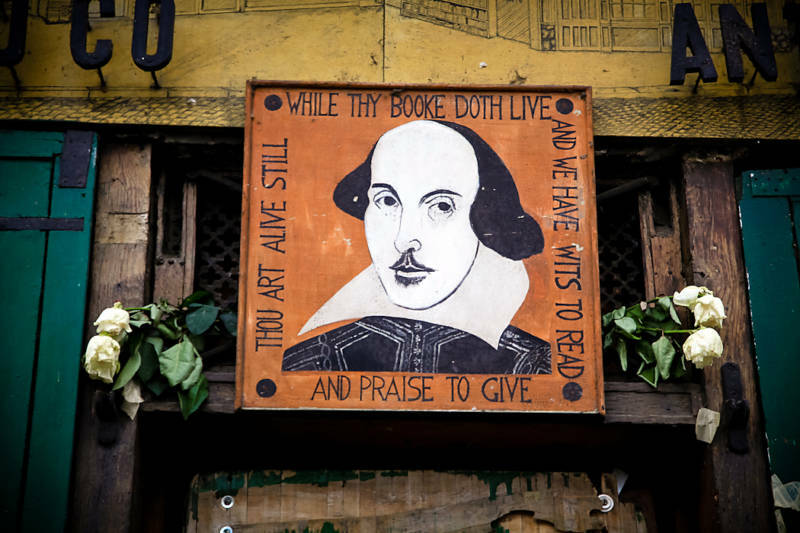 Whitfield said that creating image-based PowerPoint storyboards is a way to help both dyslexic and nondyslexic students better understand the words and the underlying emotional meaning of Shakespearean texts. She described the work of one student, Sophia, who took Adrianna’s speech from Act II, Scene II from The Comedy of Errors, and carefully created her own image slides that represented what each line, or in some cases each word, meant to her. Whitfield said that in classrooms, students might even be able to turn the slideshow into a kind of performance, playing the slides and reciting the text simultaneously. “It was just really exciting how she helped the students break through that barrier,” Carey said. 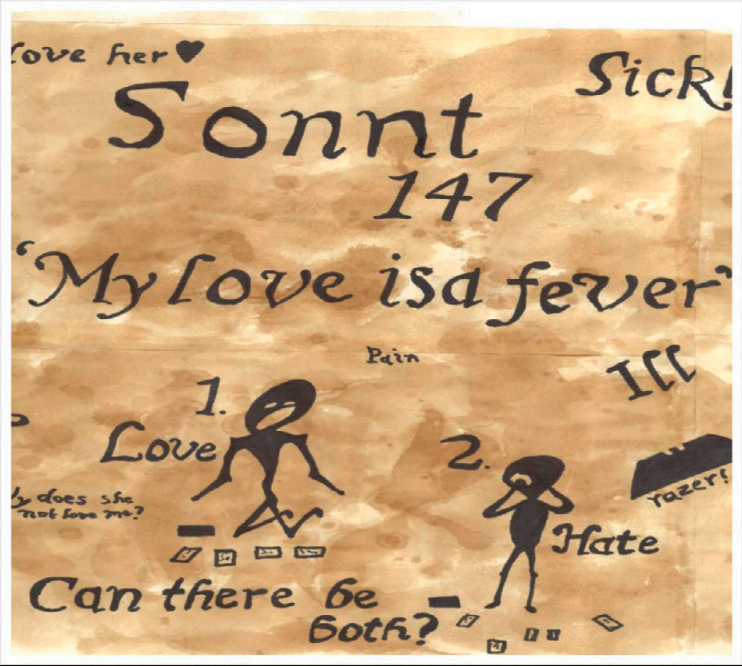 Section of a storyboard of Sonnet 147 illustrating "My love is as a fever longing still for that which longer nurseth the disease." Courtesy of Petronilla Whitfield. Whitfield, who said all her experience and expertise was in helping university drama school students, said that visual methods may also work well with high school students studying Shakespeare, with the understanding that each teacher must adapt the methods to her teaching style and her individual students. She found that dyslexic students were already often using their own version of visual aids without even realizing it -- intuitively using symbols, pictures or even doodles drawn onto the text, but that even students who don’t struggle with reading might find visual storyboarding helpful. *A previous version of this article misstated that Petronilla Whitfield worked with staff and students directly. **An earlier version misidentified the coach as Petronilla Whitfield. We regret these errors.